A cure for Alzheimer’s? A promising treatment is moving to human trials. Longer lives and helping humans win: 10 reasons not to give up on 2019. What you get when you add rabbit DNA to a plant: a cure for air pollution. Canada is almost as bad as the US. 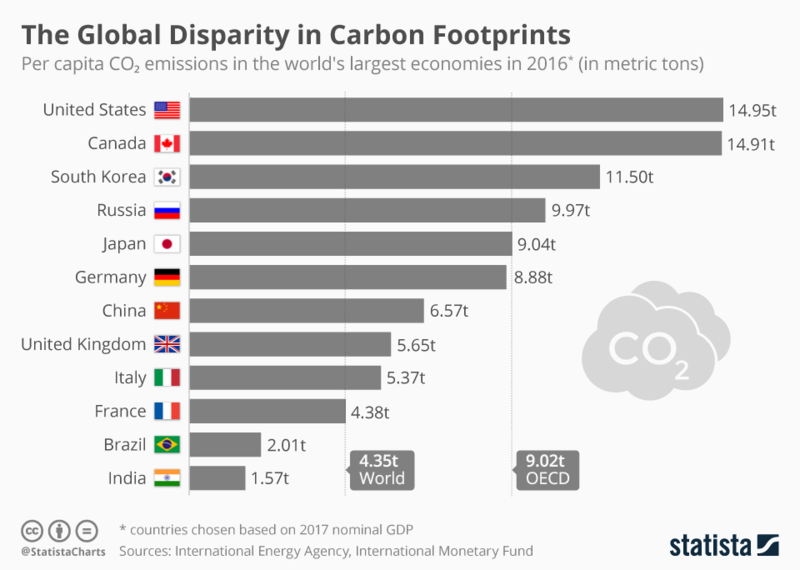 Per capita carbon footprints, by country. How to cut prison budgets – and crime. A new way to scale up solutions. Anxious? Depressed? Steps the world must take on mental health. Age against the machine. Wringing every drop out of a long life. The Aztecs and medieval Christians did it too. We need to stop strait-jacketing globalization. Not too late to say no: we have to talk about human genetic engineering. Keynes was 100 years late. A take from 1830 on economic progress. Discreet power: an ethnographic study of how the Forum shapes agendas. A “women-focused investment” fund in South Korea. Cites Gender Gap Report. (Bloomberg)From all of us at the World Economic Forum, thank you for reading.